Made from ultra-low-density polyethylene, this sleek wave top bag features a sturdy carrying handle and a large flat-bottomed gusset for a flat container for extra stability during transport. Made from ultra-low-density polyethylene, this sleek wave top bag features a sturdy carrying handle and a large flat-bottomed gusset for a flat container for extra stability during transport. The large round die cut make for a a very strong handle, and the wave extends above the top of the bag for easier bagging. The super wave top bag is a durable and affordable bag for books, magazines and other small items. The sturdy gusset on the bottom makes it very convenient for your customers to carry it home while protecting the recently purchased products. 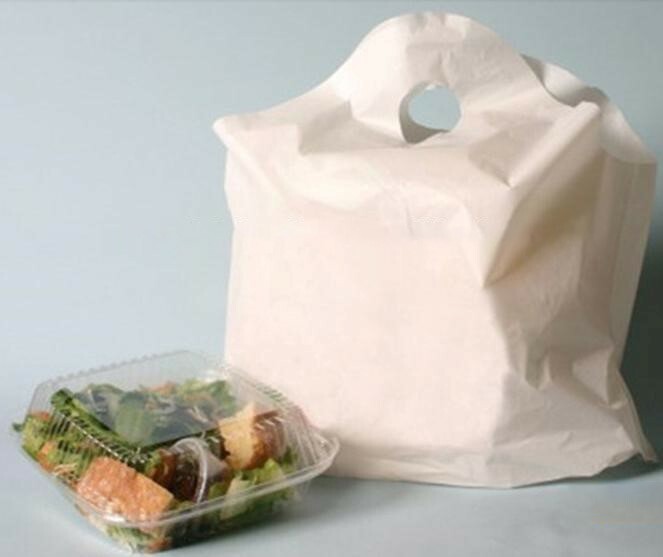 Reusable retail wave top bags, the wave handle is a practical and economical choice for many retailers. - FDA / USDA approved for food contact. - Quickly package bulky merchandise. - Wide-mouth bags, perfect for restaurant carryout. - Large-bottom gusset bags stand alone for fast packing. - Stronger, tear-resistant for heavier packages. - A practical and elegant way to carry your lunch or other goods. - The fascinating print design is ideal for restaurant or catering applications. - The bottom lays flat to allow for your lunch or snack to lay flat without it being smashed.